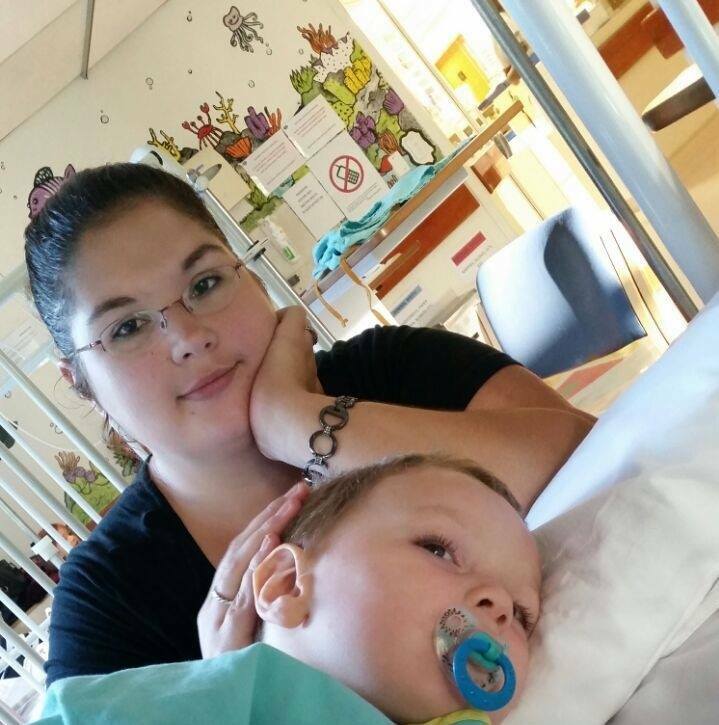 This Page is dedicated to raising funds to help pay for surgery for my 2 year old son Alex who is fighting Brain Cancer caused by a Pituitary Gland Tumour. My name is Yolandi le Roux and I am the proud Mommy of a beautiful 2 year old boy named Alexander le Roux (Alex, as I call him). We discovered Alex€™s tumor on the 19.07.2016. I took Alex to our local GP Dr that day. She could not see what the problem was and admitted him for a pediatrician. His Dr said to me at that point that she thinks he is only being knotty and wants my attention. She said she will do an MRI just for incase. The MRI at that point showed that Alex had 2 lesion€™s. The Neurosurgeon, that we were revered to send us home with 3 weeks steroids and some vitamins. On the follow up he said that it was most likely nothing to be worried about and that it looks just like water and it will go away, we must continue with the vitamins he gave us and repeat the MRI in 6 months. After 6 months I took Alex to the GP Dr for a referral for the MRI. The following day I took Alex for the MRI. I asked one of the staff that did the MRI if the tumor was no longer there. The tumor infect grow larger. I took Alex back to our GP so I could see the Neurosurgeon. Unfortunately the Neurosurgeon that was helping Alex from the start no longer wanted to help with Alex. So I started looking for Doctors that could help Alex. ( called 9 Neurosurgeon, none of the 9 wanted to see children) My sister works at a Hospital and gave me one of the Neurosurgeon that works at the hospital she works in. I called him and he said he will help Alex. I found a Dr for Alex. He performed a another MRI too confirm the size of the tumor it was 16mm. He said that I must not let anyone take the tumor out he would not advise it. Alex would die if it€™s taken out. He revered me to an oncology center. So that we can start some form of treatment. The oncology center took all the MRI€™S that we did and a lot of blood testing his liver and kidneys. She called me back said that they unfortunately can€™t do any chemo or radiation on him as it would have no effect on the tumor only make it grow more. She put him on medicine. Benoit for the pain and swelling that€™s around the tumor and DDAVP to help Alex control his urine flow. That is unfortunately affected as well by the tumor. She revered us to another Neurosurgeon. This Dr only said that he can€™t help us Alex will only maybe see his 5th birthday. He did not want to give Alex any pain medication or even look at him. He only revered me to another Neurosurgeon. I did not go and see that dr. I could not and still won€™t accept anyone telling me that my boy will only maybe be with me for 5 years. So the family stared looking for another Dr. My father called one of the Dr and he was very surprised by what my father was telling him and agreed to see Alex. He said that it is very well possible that his tumor can be removed; unfortunately he did not take our medical aid. He revered us to one of his friend that indeed did take ouer medical aid. We are currently with a Neurosurgeon that is helping Alex. Alex did go for an operation to remove the tumor. It was unsuccessful Alex started to bleed and they had to stop. Dr only could remove 2mm from the tumor. The tumor is now 3cm big growing with enormous speed. Dr send the tumor away to be tested. Alex got tumor on the forth of third ventricle with stage 1 tumor/cancer. Dr€™s report is not yet available. I did ask for it he did not yet sign it off. Dr does not know why Alex is behaving like a normal child. Except for his eyes and kidneys, speech. Alex thinks like a normal toddler eats and drinks like a normal toddler. Dr took pictures to show his colleges. Alex is a special child and only deserves the best. We are currently raising funds to try and pay for all his mounting medical bills. If after reading Alex€™s story €“ you feel it in your heart as a parent to make a small contribution for Alex Please make your pledge in the comments section below and I will message you the banking details. €¢ Aggression, Alex has a lot of pain that gives him aggression he will hit or hit his head to stop the pain.